Hi! I’m Darien Gee, Founder and Recipe Curator for the Friendship Bread Kitchen. I’m also the author of Friendship Bread: A Novel (Ballantine Books) and all the novels that followed. About the Kitchen: The Friendship Bread Kitchen was born on January 13, 2010 while I was writing my novel and experimenting with different Amish Friendship Bread variations. 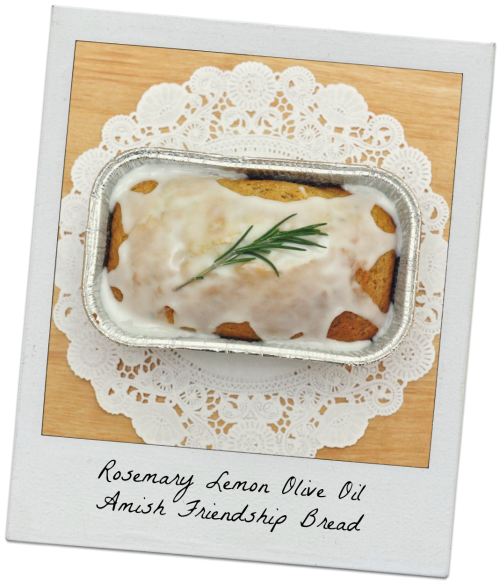 My mission was simple: meet like-minded people who loved Amish Friendship Bread and maybe even swap a few recipes. For almost a year my house smelled of sugar and cinnamon. I was writing, I was baking, I was connecting with people about the book and the bread. I looked for ways to make it gluten free (tricky) or low cholesterol (easy), but above all accessible to everyone. I wanted people to have fun with it, to be creative with it, and to share it with others. That’s still my intention today. The Friendship Bread Kitchen is a place to kick up your feet and share recipes, tips, stories, and community. I’ve tried a lot of different things with the Kitchen over the years. Some things worked and some things didn’t. Features I loved didn’t take off and things I thought wouldn’t make much difference have stuck around. I’ve learned a lot and I’m still learning. I’m not one to beat her head against the wall, at least not too many times. I finally sat down and looked at where people were going and what they needed. I clarified what I liked to do and what made me nuts. I figured out what was essential and what needs improvement. I ended up with this: I’m choosing to build the Kitchen into an Amish Friendship Bread resource center, so that whenever you are inspired to make and share the bread, you’ll know where to go if you need any help. 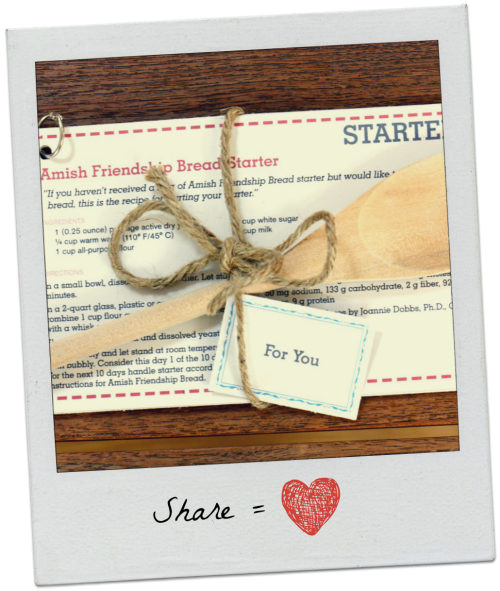 What you’ll find here: Amish Friendship Bread recipes, tutorials, the occasional blog post, the occasional newsletter, the occasional giveaway, and free printables to help you gift your Amish Friendship Bread. What I’m looking for: I’m always looking for beautiful, natural light photography of the bread, as well as new and innovative recipes. I’m especially interested in personal experiences with the starter or the bread. You’ll retain ownership and receive credit for any submissions that appear on the Friendship Bread Kitchen website and social media channels. Please view the submission guidelines here. Ads: In late 2014 I began running ads after four years of being ad-free. The ads help defray the cost of running the site but more importantly help me stay sane as watching money walk out the door was stressful and not fun. I thought of closing the site several times because of this, but the ads have made it possible to keep going. My ad networks are family-friendly. Your support of the Kitchen by shopping in our Amazon store or buying the cookbooks is also huge and greatly appreciated. Work with me: I’d love to work with brands that naturally serve the Friendship Bread Kitchen community, primarily baking brands and kitchenware. I am also happy to connect with other bloggers. Please contact me if you’d like to explore sponsored posts, site sponsorship, or other collaborative opportunities. What I do: I’m a writer. Writing is the most intuitive thing about me. I’ve written both fiction and nonfiction (including the cookbook series for the Friendship Bread Kitchen) but I love telling stories. I don’t call it my day job, it’s just a big part of who I am and how I live in this world. You can find my books written under my pen name, Mia King, or my own name, Darien Gee. I wish I could say I divide my time evenly between the Kitchen and my writing, or my writing and my family, but the truth is I spend a lot of time just winging it. I’m always doing the best I can, and sometimes that’s not good enough, even for me. I’m working on it. How you can help: I’d love your help in spreading the word about the Kitchen through your social media network of choice, by baking a loaf of Amish Friendship Bread for a neighbor, by leaving the occasional comment on my occasional posts, by linking up to a recipe you like, or by subscribing to my RSS feed. Where I live: I live on the Big Island of Hawaii. I moved here with my husband when I was seven months pregnant in 2000. We were management consultants living in San Francisco and knew we needed a change if we wanted to be healthier and, if we were lucky, happier. The long short of it is…we are. One more thing: I’m not Amish. I was born in St. Louis, Missouri to a geophysicist dad and a social worker mom. I’m Chinese-American. As for the bread, there’s a lot of talk about whether or not Amish Friendship Bread is actually Amish, too. I no longer spend time debating that issue, because for me the essence of the bread is Amish — sharing what you have with others. And since each recipe yields two loaves, you can keep one and give one away. I can’t think of anything more perfectly designed than that. Thank you for being in the Kitchen with me!